Oink, oink! The swimming pigs of the Exumas are an unexpected treat. If you can’t fly, swim. We couldn’t resist the following video of everyone’s favorite swimming pigs. If you’ve been to The Exumas in The Bahamas, you may have made the trip to see the swimming pigs. We saw it firsthand on our 2016 Swimsuit Shoot, and most claimed it to be the best part of the trip. The pigs are a somewhat mysterious fixture on Big Major Cay, an uninhabited island. The island is also known as Pig Beach (obviously). How did they get there? No one really knows for sure. Some say they were left by a group of sailors, who planned to come back and cook them. Or that the pigs swam over from a shipwreck nearby. Some say it was pirates. While the origins of the pigs may be murky, one thing is very clear: the pigs are a unique must-see. 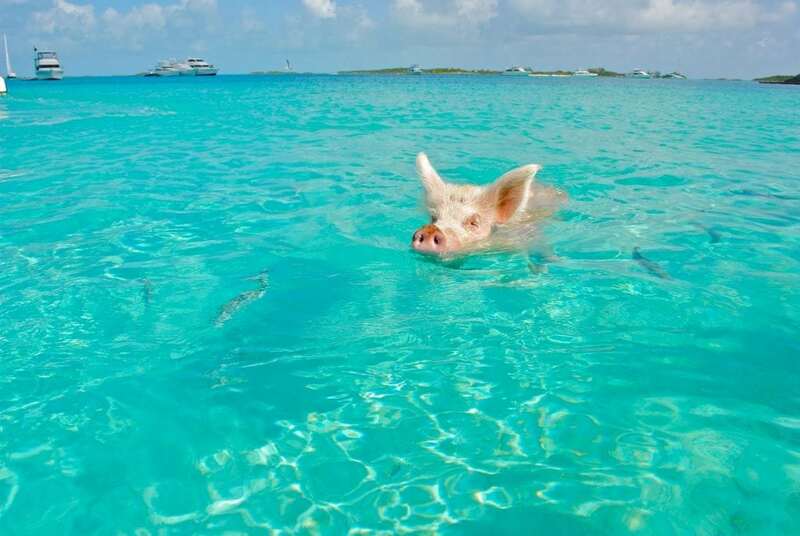 Have you been to the Exumas and seen the swimming pigs firsthand? Tell us about your experience in the comments. If you have pictures to prove it, send them to me, erin@southernboating.com, and I’ll post them in next week’s email. Oink, oink! Special thanks to GIV Bahamas Inc. and Grand Isle Resort for this video.